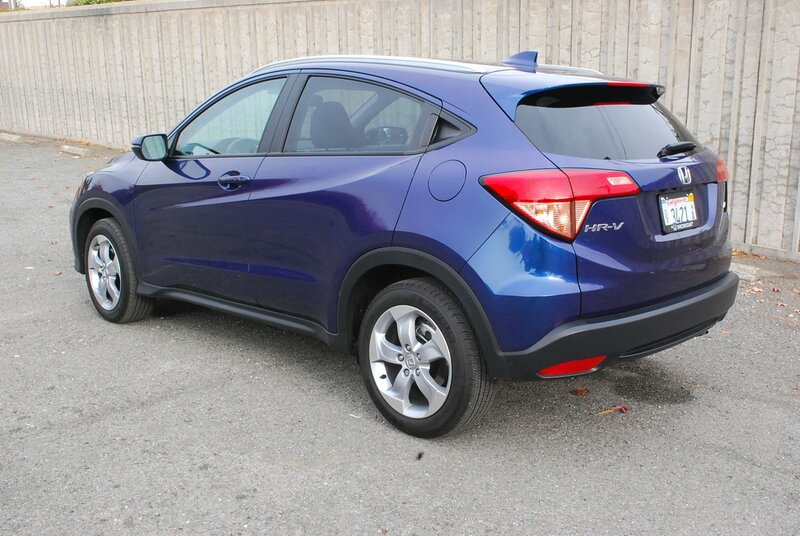 Honda introduced the 2016 HR-V only 4 months into the 2015 model year. Thus, the earliest releases are nearing 8 months old before their proper 2016 model year clock even begins to count down. This is a great way to stave off the unavoidable depreciation that bedevils new cars the instant they drive off the dealer’s lot. 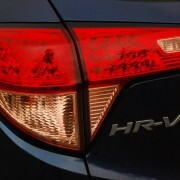 The HR-V is in many ways – especially size and price – what the CR-V once was before it got fat and expensive. 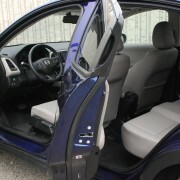 HR-V is a crossover sports utility body appended to a stretched Honda Fit chassis. At 169 inches in length, it’s 9 inches longer than the sub-compact Fit. It’s also 4 inches longer in wheelbase, which allows three adults to fit into the back seat with more leg room than greets them in the Fit. By comparison to the HR-V, the current CR-V seems huge, with its 10 extra inches of length and 500 extra pounds of curb weight. 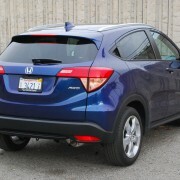 At 3,045 pounds, the HR-V itself is fully 400 pounds heavier than the Fit sedan upon which it is based. 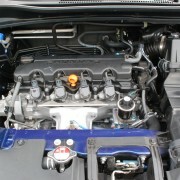 To compensate for that, Honda upgraded the HR-V’s inline 4 from the Fit’s 130hp and 1.5 liters to 141hp and 1.8 liters. 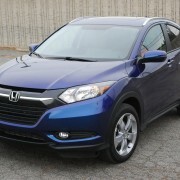 It’s not enough of a boost, however, to prevent the HR-V from being one of the slowest accelerating new rigs on the road. 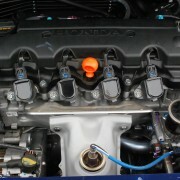 The problem stems from the fact that its power-to-weight ratio stands at a lethargic 21.6 pounds for each horse to move. 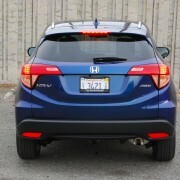 By contrast, the Fit figure is 20.1 lb/hp, and the 185hp CR-V tops them all at 19.0 lb/hp. 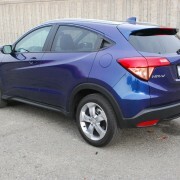 The fact that Honda equips the HR-V with a continuously variable transmission (CVT) exacerbates the problem. Unlike a gearbox with fixed ratios, the CVT takes longer to spool the engine up, with more noise accompanying each demand for more power. While this is not the vehicle of choice for freeway merges or two lane passes, it offers other attributes that almost make you forget about its power shortfall. 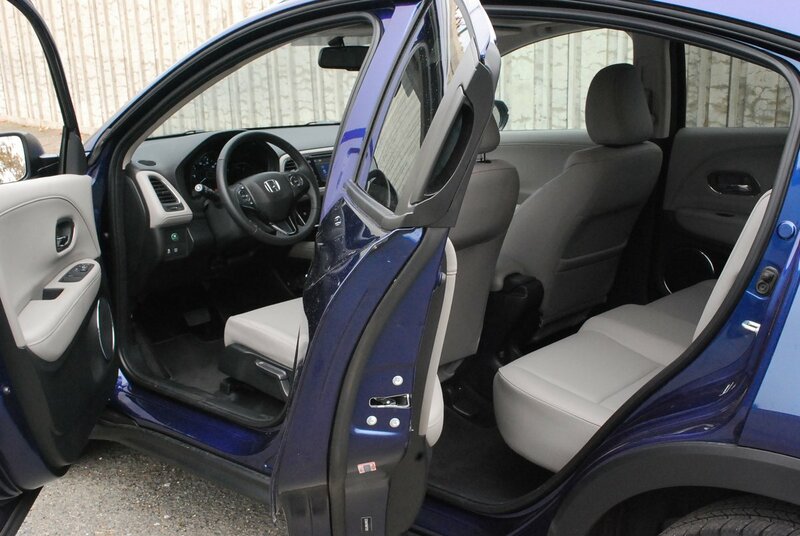 Compared to the Fit, the HR-V carries almost twice the amount of cargo: 32 cubic feet vs. 17 for the Fit. Even better, Honda has configured the interior so the 60/40 split second row “Magic Seats” fold virtually flat, allowing maximum utilization of all that generous interior space. 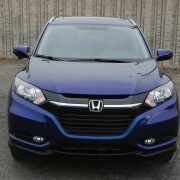 The HR-V is a lot of fun to drive on a two-lane back road. 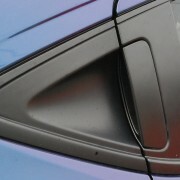 In that sense, it emulates the Fit, with sensitive and accurate electric power assisted rack and pinion steering. 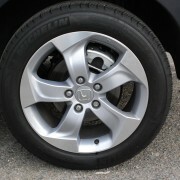 The EX-L’s standard issue 7.5 inch x 17 inch five spoke alloy rims not only look rugged, but plant a solid footprint on the pavement, with all season Michelin rubber measuring 215/55R17 at each corner. 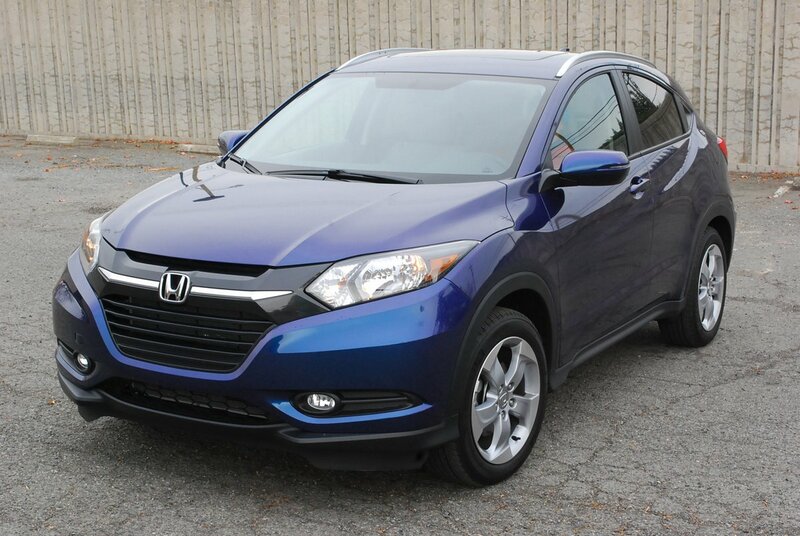 The HR-V is stiffly sprung, so it’s quick to change direction at the flick of your wrist. It’s easy to set up a nice rhythm with this petite sports utility when you’re flinging it through a succession of curves. The drawback to this suspension calibration is a choppy ride over imperfect pavement. As a passenger trying to read a newspaper, I found it all but impossible to follow a line of print as my head constantly bobbed. 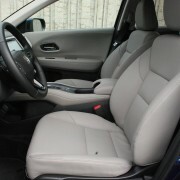 The HR-V is loaded with comfort and communication features not generally found in a vehicle with a base price of $25,840. For example, standard Smart Entry makes life much easier when your hands are full of grocery bags. The door locking/unlocking sequence is custom programmable. The communication system includes Bluetooth Audio, Hands Free operation, and Next Generation HondaLink with smart phone applications. XM Satellite and HD Radio are standard, with HD traffic reports available in select markets. The EX-L HR-V comes with standard navigation which plays through a 7 inch central display screen. This screen also carries a camera feed while backing up and a second feed from the Lane Watch camera mounted in the right side rear view mirror. Unfortunately, the display screen receives commands only through taps on its graphic user interface since Honda has seen fit to eliminate control knobs. Thus it takes way too much concentration to do something as simple as turn the radio volume up or down. 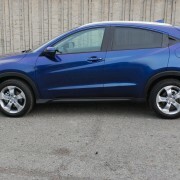 If you are in the market for an affordable, space efficient mini SUV, with exceptional gas economy and lots of built-in smart phone features, the newest member of the Honda family may offer just the right combination of sensible features at an irresistible price. 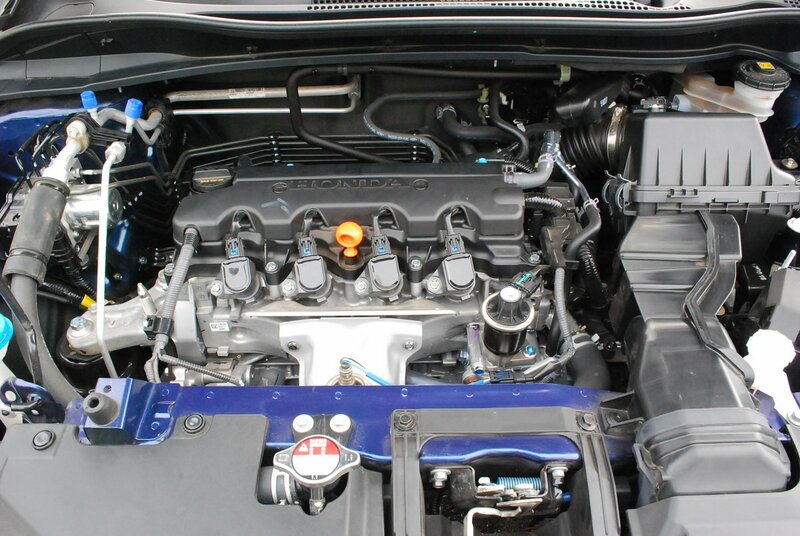 Honda Accord Type-S With 180HP Diesel For Euro, Not U.S.
2010 Chevrolet Camaro vs. 2010 Ford Mustang – Which one does retro better?